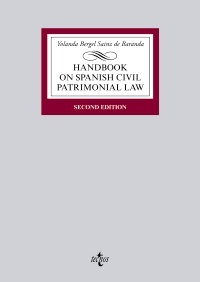 This Handbook on Spanish Civil Patrimonial Law is a concise and accurate introduction to Spanish Civil Law. It is especially interesting for students in degrees with an economic content (Business Administration, Economics, Accounting and Finance, Tourism, etc. It is a basic test for students and teachers in the bilingual studies. It gives a general overview of the Spanish Civil Law, focusing on the on the economic aspects of the legal relations and institutions. This second edition is completely updated; it includes new legislation and the latest relevant decisions of the Spanish Supreme Court. Furthermore, the coverage of this new edition has been expanded and we have included more examples and new cases and activities.